The Warring States period (Script error), also known as the Era of Warring States, is a period in ancient China following the Spring and Autumn period and concluding with the victory of the state of Qin in 221 BC, creating a unified China under the Qin Dynasty. Different scholars use dates for the beginning of the period ranging between 481 BC and 403 BC, but Sima Qian's date of 475 BC is most often cited. Most of this period coincides with the second half of the Eastern Zhou Dynasty, although the Chinese sovereign (king of Zhou) was merely a figurehead. The name of the period was derived from the Record of the Warring States, a work compiled early in the Han Dynasty. Qin: The State of Qin was in the far west, with its core in the Wei River Valley and Guanzhong. This geographical position isolated it from the states of the Central Plains, which limited its initial influence but also afforded it protection from other states. Qi: located in the east of China, centred around the Shandong Peninsula, described as east of Mount Tai but whose territory extended far beyond. On the southeast coast near Shanghai was the State of Yue, which was highly active in the late Spring and Autumn era but was eventually annexed by Chu. In the far southwest in Sichuan were the States of Ba and Shu. These were non-Zhou states that were conquered by Qin late in the period. In the Central Plains, comprising much of modern-day Henan Province, many smaller city states survived as satellites of the larger states, though they would eventually be absorbed as well. Between the states of Zhao and Yan was the state of Zhongshan, which was eventually annexed by Zhao in 296 BC. 481 BC: this is the starting point proposed by Song-era historian Lü Zuqian, since it is the end of the Spring and Autumn Annals. 476 BC-475 BC: this starting point is based on the Records of the Grand Historian. Sima Qian, author of the Records, chose this year since it was the inaugural year of King Yuan of Zhou. 453 BC: this starting point is based on the Partition of Jin into Han, Zhao, and Wei, destroying a key state of the earlier period and creating three of the seven warring states. 441 BC: this starting point is also based on the inaugural year of Zhou Kings, in this case the inaugural year of King Ai of Zhou. 403 BC: this is the starting point proposed by Sima Guang, author of the Zizhi Tongjian, being the year when Han, Zhao and Wei were officially recognised as states by the Zhou court. 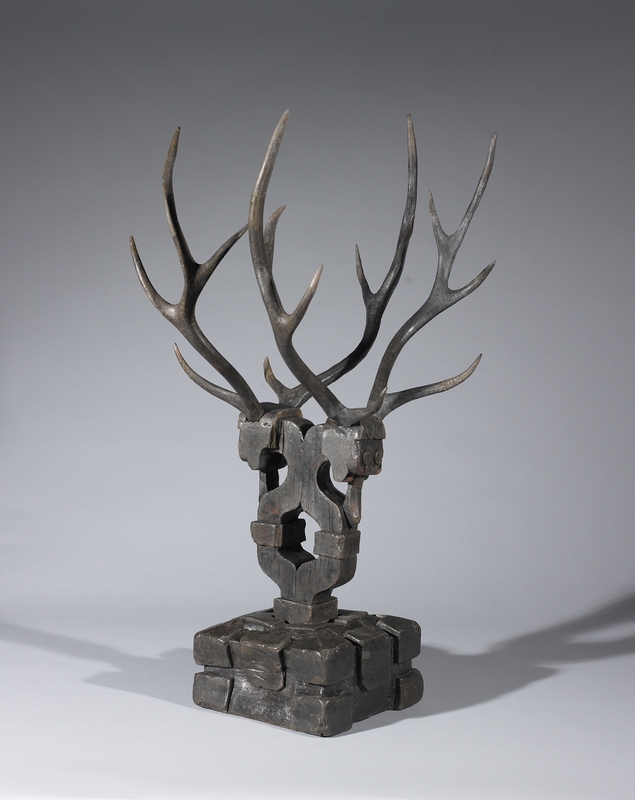 Sima Guang states that this, as a symbol of the final erosion of Zhou authority, should be taken as the start of the Warring States era. The system of feudal states created by the Western Zhou Dynasty underwent enormous changes after 771 BC with the flight of the Zhou court to modern-day Luoyang and the diminution of its relevance and power. The Spring and Autumn Period led to the strengthening of a few states at the expense of many others, who could no longer depend on central authority or legitimacy for their protection. The struggle for hegemony eventually created a state system dominated by several large states, such as Jin, Chu, Qin and Qi, while the smaller states of the Central Plains tended to be their satellites and tributaries. Other major states also existed, such as Wu and Yue in the southeast. The last decades of the Spring and Autumn era were marked by increased stability, as the result of peace conferences between Jin and Chu which carved out their respective spheres of influence. This situation would end with the partition of Jin, whereby the state was divided between the houses of Han, Zhao and Wei, creating the situation of seven major warring states. Since the middle of the 6th century BC, the rulers of Jin had steadily lost political powers to their nominally subordinate nobles and military commanders, a situation arising from the traditions of the Jin which forbade the enfeoffment of relatives of the ducal house. This allowed other clans to gain fiefs and military authority, and decades of internecine struggle led to the establishment of four major families, the Han, Zhao, Wei and Zhi. In 453 BC, at the Battle of Jinyang, the Han, Zhao and Wei allied and destroyed the Zhi family, dividing its lands between them. With this, they became the de facto rulers of most of Jin's territory, though this situation would not be officially recognised until half a century later, by King Weilie of Zhou. During the first 50 years the division of Jin allowed the other states to expand, Chu and Yue northward and Qi southward. Qin increased its control of the local tribes and began its expansion southwest to Sichuan. From before 405 until 383 the three Jins were united under the leadership of Wei and expanded in all directions. The most important figure was Marquess Wen of Wei (445-396). In 408-406 he conquered the State of Zhongshan to the northeast on the other side of Zhao. At the same time he pushed west across the Yellow River to the Luo River taking the area of Xihe (literally 'west of the [Yellow] river'). A jade-carved dragon garment ornament from the Warring States period. King Hui of Wei (370-319 BC) set about restoring the state. In 362-359 BC he exchanged territories with Han and Zhao in order to make the boundaries of the three states more rational. In 344 BC he assumed the title of king. In 341 BC, Wei attacked Han. Qi allowed Han to be nearly defeated and then intervened. The generals from the Battle of Guiling met again (Sun Bin and Tian Ji versus Pang Juan), by using the same tactic, attacking Wei's capital. Sun Bin feigned a retreat and then turned on the overconfident Wei troops and decisively defeated them at the Battle of Maling. This is the most complex part of the Warring States period. It corresponds to the reign of King Min of Qi and the schemes of Lord Mengchang of Qi and Su Qin. 300 BC: Lord Mengchang of Qi, grandson of the former King Wei of Qi came to power when King Min acceeded to the throne. He made a westward alliance with the States of Wei and Han. In the far west, Qin, which had been weakened by a succession struggle in 307, yielded to the new coalition and appointed Lord Mengchang its chief minister. This "horizontal" or east-west alliance might have secured peace except that it excluded the State of Zhao. 298 BC: Zhao offered Qin an alliance and Lord Mengchang was driven out of Qin. The remaining three allies, Qi, Wei and Han, attacked Qin, driving up the Yellow River below Shanxi to the Hangu Pass. After 3 years of fighting they took the pass and forced Qin to return territory to Han and Wei. They next inflicted major defeats on Yan and Chu. During the 5-year administration of Lord Menchang, Qi was the major power in China. 294 BC: Lord Mengchang was implicated in a coup d'etat and fled to Wei. His alliance system collapsed. Qi and Qin made a truce and pursued their own interests. Qi moved south against the State of Song whilst the Qin General Bai Qi pushed back eastward against a Han/Wei alliance, gaining victory at the Battle of Yique. In 288 BC the two rulers took the title of "Di", (帝 literally emperor), of the east and west respectively. They swore a covenant and started planning an attack on Zhao. 287 BC: The diplomat Su Qin, possibly an agent of Yan, persuaded King Min that the Zhao war would only benefit Qin. King Min agreed and formed a 'vertical' alliance with the other states against Qin. Qin backed off, abandoned the presumptuous title of "Di", and restored territory to Wei and Zhao. In 286 Qi annexed the state of Song. 285 BC: The success of Qi frightened the other states (some say that this was part of Su Qin's plan). Under the leadership of Lord Mengchang, who was exiled in Wei, Qin, Zhao, Wei and Yan formed an alliance. Yan had normally been a relatively weak ally of Qi and Qi feared little from this quarter. Yan's onslaught under general Yue Yi came as a devastating surprise. Simultaneously, the other allies attacked from the west. Chu declared itself an ally of Qi but contented itself with annexing some territory to its north. Qi's armies were destroyed and the King Min was slain. Qi was reduced to the two cities of Ju and Jimo. King Min himself was later captured and executed by his own followers. After 284 BC Tian Dan was able to restore much of the state's territory, but it never regained the influence it had under King Min. After Chu was defeated in 278, the remaining great powers were Qin in the west and Zhao in the north-center. There was little room for diplomatic maneuver and matters were decided by war in 265-260. Zhao had been much strengthened by King Wuling of Zhao (325-299). In 307 he enlarged his cavalry by copying the northern nomads. In 306 he took more land in the northern Shanxi plateau. In 305 he defeated the northeastern border state of Zhongshan. In 304 he pushed far to the northwest and occupied the east-west section of the Yellow River in the north of the Ordos Loop. King Huiwen of Zhao (298-266) chose able servants and expanded against the weakened Qi and Wei. In 296 his general Lian Po defeated two Qin armies. In 265 King Zhaoxiang of Qin made the first move by attacking the weak state of Han which held the Yellow River gateway into Qin. He moved northeast across Wei territory to cut off the Han exclave of Shangdang north of Luoyang and south of Zhao. 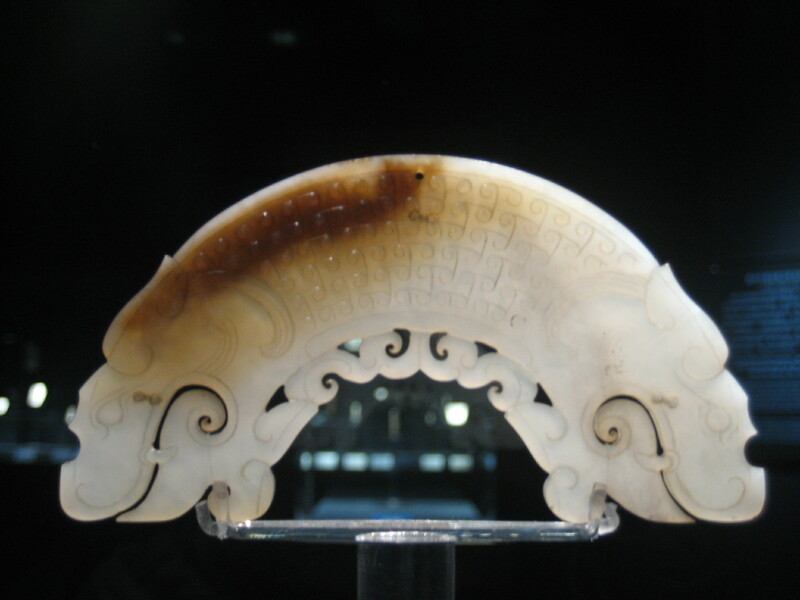 The Han king agreed to surrender Shangdang, but the local governor refused and presented it to King Xiaocheng of Zhao. Zhao sent out Lian Po who based his armies at Changping and Qin sent out general Wang He. Lian Po was too wise to risk a decisive battle with the Qin army and remained inside his fortifications. Qin could not break through and the armies were locked in stalemate for three years. The Zhao king decided that Lian Po was not aggressive enough and sent out Zhao Kuo who promised a decisive battle. At the same time Qin secretly replaced Wang He with the notoriously violent Bai Qi. When Zhao Kuo left his fortifications, Bai Qi used a Cannae maneuver, falling back in the center and surrounding the Zhao army from the sides. After being surrounded for 46 days, the starving Zhao troops surrendered (September 260 BC). It is said that Bai Qi had all the prisoners killed and that Zhao lost 400,000 men. The general policy of Chu was to slowly annex the small states to its north. By late in the period it had a common border with Qi and Wei. 389: Early in the Warring States Period, Chu was one of the strongest states in China. The state rose to a new level of power around 389 BC when King Dao of Chu (楚悼王) named the famous reformer Wu Qi as his chancellor. 334:Chu rose to its peak in 334 BC, when it conquered Yue to its east on the Pacific coast. The series of events leading up to this began when Yue prepared to attack Qi to its north. The King of Qi sent an emissary who persuaded the King of Yue to attack Chu instead. Yue initiated a large-scale attack at Chu but was defeated by Chu's counter-attack. Chu then proceeded to conquer Yue. 278: General Bai Qi of Qin attacked from Qin's new (from 316) territory in Sichuan to the west of Chu. The capital of Ying was captured and Chu's western lands on the Han River were lost. The effect of 334 and 278 was to shift Chu significantly to the east. In 344 BC King Hui of Wei changed his title from Marquess to King. In 334 BC his victorious enemy, King Wei of Qi adopted the same title. In 325 the rulers of Qin and Han declared themselves kings, followed by those of Zhao, Yan, and Zhongshan in 323 BC. In 318 BC, the ruler of Song, a relatively minor state, declared himself king. The ruler of Zhao held out until around 299 BC, and was the last to take the royal title. In 288-287 the kings of Qin and Qi briefly called themselves "emperor" (di), before reverting to "king". 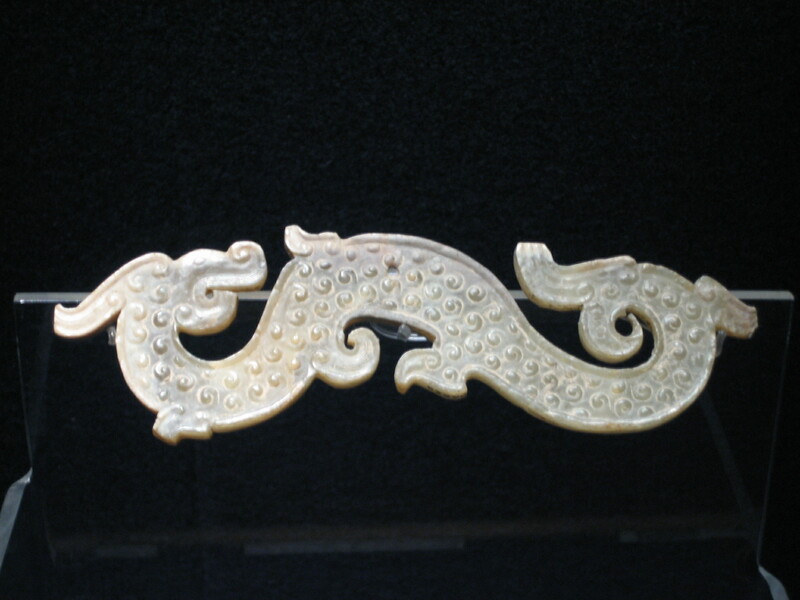 A jade-carved huang with two dragon heads, Warring States, Shanghai Museum. After the Zhou were driven out of the Wei River valley in 771 BC the house of Qin was given the task of restoring Zhou rule in the valley. This they did by slowly absorbing the local Rong tribes. The valley was bounded on the south by high mountains and on the north by dry country. Its great advantage was its location in the far west "within the passes" which tended to keep Qin out of needless wars with the other states. There is little information about the early history of Qin during the Spring and Autumn Period. Most of its interactions were with its powerful eastern neighbor, Jin. In 632 Duke Mu of Qin (660-621) helped Jin win the Battle of Chengpu against Chu. In 579 Qin, Jin, Chu and Qi held a peace conference and agreed to limit the size of their armies. During the early Warring States period Qin generally avoided conflicts with the other states. It began to become aggressive after the Shang Yang reforms of about 356 and then played a very active role in the final 180 years (300-221 BC). Circa 408 Wei pushed Qin back to the Luo River occupying the Xihe area west of the Yellow River. 364: Qin defeated Wèi and Han at the battle of Shimen. Wei was saved by the intervention of Zhao. 356-338: Shang Yang made centralizing and authoritarian reforms. 340: Qin took land from Wèi after it had been defeated by Qi. 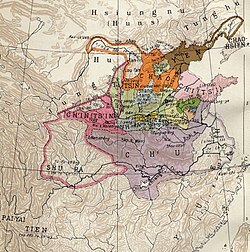 316: Qin conquered Shu and Ba in Sichuan to the southwest. Development of this area took a long time but slowly added greatly to Qin's wealth and power. 325: The Duke of Qin took the title of king. 312: Qin defeated an attack from Chu. 307: Qin was weakened by a disputed succession. 301:For the intervention of Qi see "period of Qi" above. 269: General Lian Po of Zhao decisively defeated two Qin armies. After 269: Fan Sui became chief advisor. He advocated authoritarian reforms, irrevocable expansion and an alliance with distant states to attack nearby states (the twenty-third of the Thirty-Six Stratagems). His maxim "attack not only the territory, but also the people" enunciated a policy of mass slaughter that became increasingly frequent. 278: Qin's notoriously bloody general Bai Qi captured the Chu capital and pushed the Qin frontier east of Sichuan. 265: Qin started a war with Han, probably to open up the Yellow River corridor south of Shanxi. 260: Zhao aided Han but its power was broken by Bai Qi at the Battle of Changping. Qin was now the strongest state in China. In 230 BC, the Qin state conquered the Han state. Han, the weakest of the Seven Warring States, was adjacent to the much stronger Qin, and had suffered continuous assaults by Qin in earlier years of the Warring States Period. This went on until Emperor Qin Shi Huang sent general Wang Jian to attack Zhao. King An of Han, frightened by the thought that Han would be the next target of the Qin state, immediately sent diplomats to surrender the entire kingdom without a fight, saving the Han populace from the terrible potential consequences of an unsuccessful resistance. In 223 BC, Qin invaded the relatively strong Chu state. However, the first invasion was an utter disaster when 200,000 Qin troops, led by the inexperienced general, Li Xin, were defeated by 500,000 Chu troops in the unfamiliar territory of Huaiyang, modern-day northern Jiangsu and Anhui provinces. Xiang Yan, the Chu commander, had lured Qin by allowing a few initial victories, but then counterattacked and burnt two large Qin camps. The following year, Wang Jian was recalled to lead a second invasion with 600,000 men. High in morale after their victory in the previous year, the Chu forces were content to sit back and defend against what they expected to be a siege of Chu. However, Wang Jian decided to weaken Chu's resolve and tricked the Chu army by appearing to be idle in his fortifications whilst secretly training his troops to fight in Chu territory. After a year, the Chu defenders decided to disband due to apparent lack of action from the Qin. Wang Jian invaded at that point, with full force, and overran Huaiyang and the remaining Chu forces. Chu lost the initiative and could only sustain local guerrilla-style resistance until it too was fully conquered with the destruction of Shouchun and the death of its last leader, Lord Changping of Chu, in 223 BC. At their peak, the combined armies of Chu and Qin are estimated to have ranged from hundreds of thousands to a million soldiers, more than those involved in the campaign of Changping between Qin and Zhao 35 years earlier. In 222 BC, Qin conquered Yan and Zhao. After the conquest of Zhao, the Qin army then turned its attention towards Yan. Realizing the danger and gravity of this situation, Crown Prince Dan of Yan had sent the assassin Jing Ke to kill the Qin king, but this failure only helped to fuel the rage and determination of the Qin king, and he increased the number of troops to conquer the Yan state. In 221 BC, Qin conquered Qi. Qi was the final unconquered warring state. It had not previously contributed or helped other states when Qin was conquering them. As soon as Qin's intention to invade it became clear, Qi swiftly surrendered all its cities, completing the unification of China and ushering in the Qin Dynasty. Most scholars think these numbers are exaggerated (they are much larger than those from similar societies, soldiers were paid by the number of enemies they killed and the Han Dynasty had an interest in exaggerating the bloodiness of the age before China was unified). Regardless of exaggeration, it seems clear that warfare had become excessive during this period. The bloodshed and misery of the Warring States Period goes a long way in explaining China's traditional preference for a united throne. Warfare in the Warring States Period evolved considerably from the Spring and Autumn Period, as most armies made use of infantry and cavalry in battles, and the use of chariots became less widespread. The use of massed infantry made warfare more bloody and reduced the importance of the aristocracy which in turn made the kings more despotic. From this period onward, as the various states competed with each other by mobilizing their armies to war, nobles in China belonged to the literate class, rather than to the warrior class as had previously been the case. Infantrymen deployed a varieties of weapons, but the most popular was the dagger-axe. The dagger-axe came in various lengths, from 9 to 18 feet; the weapon consisted of a thrusting spear with a slashing blade appended to it. Dagger-axes were an extremely popular weapon in various kingdoms, especially for the Qin who produced 18-foot-long pikes. At the same time, the constant conflict and need for innovative social and political models led to the development of many philosophical doctrines, later known as the Hundred Schools of Thought. The most notable schools of thought include Mohism, expounded by Mozi; Confucianism, represented by Mencius and Xunzi; Taoism, represented by Zhuangzi, and Legalism, represented by Shang Yang and Han Feizi. This period is most famous for the establishment of complex bureaucracies and centralized governments, as well as a clearly established legal system. The developments in political and military organization were the basis of the power of the Qin state, which conquered the other states and unified them under the Qin Empire in 221 BC. The reforms of Shang Yang in Qin, and of Wu Qi in Chu, both centred around increased centralisation, the suppression of the nobility, and a vastly increased scope of government based on Legalist ideals, which were necessary to mobilise the large armies of the period. Ebrey, Patricia Buckley; Walthall, Anne; Palais, James B. (2006). "Pre-Modern East Asia: A Cultural, Social, and Political History". Houghton-Mifflin Company. ISBN 0-618-13386-0. http://books.google.com/books?id=YukVl8fUr48C&dq. Lewis, Mark Edward (1999). "The Cambridge history of ancient China: from the origins of civilization to 221 B.C.". In Loewe, Michael; Shaughnessy, Edward L.. Cambridge University Press. pp. 587–649. http://books.google.com/books?id=cHA7Ey0-pbEC&lpg=PP1&pg=PA587#v=onepage&q&f=false. .
Tzu, Sun; Griffith, Samuel B. (1963). "The Art of War". Oxford University Press.